Photos: (Top) Alfredo Lopez is helping lead the defense of traditional Garifuna lands on Hondura’s northern coast, by Timo Russo. (Middle) Lopez uses his show on a local radio station to galvanize opposition to the tourism industry, courtesy COMPPA. 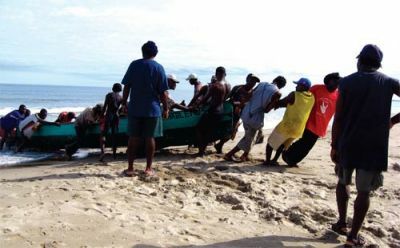 (Bottom) Garifuna fishermen return from the sea, courtesy COMPPA. TRIUNFO DE LA CRUZ, Honduras — Wedged between tropical rainforest and the Caribbean Sea in a wild, remote corner of Central America, 76 Garifuna villages lay scattered along hundreds of kilometers of pristine, white-sand beaches. Descendants of an improbable 17th-century union of a fierce indigenous people with the survivors of a pair of shipwrecked slave ships, the Garifuna inhabit one of the last pockets of communally held land in the world. They live as they have for centuries: reliant on the sea for fishing, on the beach for coconut and fruit, on the wetlands for rice cultivation and on the surrounding hillsides for growing manioc and yucca, gathering firewood and hunting game. Their simple wooden homes are built along the beaches or on stilts above the waves. Men fish from dugout canoes and dive with spears along the reefs. However, this could all soon change as the government of Honduras, the World Bank and a cabal of transnational business interests push forward with plans to transform Honduras’ northern coast into a tourist-friendly enclave. The quintessential banana republic, Honduras remains the second poorest country in the hemisphere. The Central American staples of chronic insecurity, massive migration and economic precariousness bedevil the country. And in a nation saturated by Pepsi Cola, McDonald’s, shopping malls and the tacky detritus of U.S. consumer culture, the Garifuna stand out as fantastically different. Approximately 100,000 Garifuna live along the Caribbean coast, speaking their own Igñeri dialect, a combination of Arahuaco, Swahili and Bantu. Theirs is a vibrant living culture born of a unique history. Between 1635 and 1670, two slave ships coming from West Africa ran aground off the tiny island of St. Vincent in the Lesser Antilles. So began the story of the people who came to be known as the Garifuna — born of a shipwreck and never enslaved. Their fate should have been to labor to death on the colonizers’ cotton and cane plantations, but instead they found themselves — a couple of hundred castaways — on a tropical island populated by a hostile indigenous population known as the Red Caribs. The Red Caribs rescued the shipwrecked but any goodwill ended there. The indigenous attempted to enslave the newcomers, and the Africans resisted, retreating into the western mountains of the island, forming a maroon community that in time was sought out by other runaway slaves and fugitives. So a liberated territory was consecrated, and a kind of pirate utopia blossomed in the age of 17th century capitalist expansion. Conflict with the Red Caribs was constant and occasionally brutal, but somewhere along the line love (or maybe just Cupid) overcame differences and the flowering of the union became known as “karibena galibina” — child of the Caribe, indigenous galibi — a name which underwent some morphological fine tuning to eventually become Garifuna. When the British seized control of St. Vincent from the French and the Caribs at the end of the 18th century, the Garifuna were forcibly deported to the uninhabited island of Roatan off the coast of Honduras. Many died at sea, but against all odds, the rebellious Garifuna survived once more. This ethnic group that should have been killed off a few times already now found a small space in which to work with the regional colonial masters — the Spanish. Thriving on Roatan (“We like to have lots of children,” Alfredo Lopez says), the Garifuna spread out along the Honduran coast, eventually encompassing the Caribbean coastlines of Nicaragua, Guatemala and Belize. There they intermingled uneasily with the indigenous inhabitants, always keeping their ethical and cultural identity intact. But they remained, as ever, marginalized, independent and rebellious in their little autonomous enclaves. The Garifuna fusion of Caribbean fishing and farming traditions with a mixture of South American and African music, dance and spirituality led UNE SCO in 2001 to declare the Garifuna culture one of 19 Masterpieces of the Oral and Intangible Heritage of Humanity. Tela Bay and its environs are the center of the Honduran Garifuna world, with some 36 communities dotted along an impressive 50- mile sandy shore. The largest of them, Triunfo de la Cruz, with a population of 800 families, is a quiet, unassuming village that now finds itself on the front line of the conflict. The first thing the visitor may notice about the Triunfo de la Cruz beachfront is what is missing. In this sun-drenched bay with lush sands and majestic palms, there are no beach-front hotels, no bars, no reclining tourists in bikinis sipping margaritas, no uniformed attendants sweeping up the ocean debris. 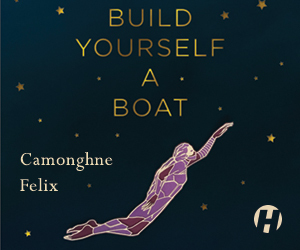 Instead there is a group of hardy fishermen dragging their small old boats from the sea, there are gaggles of raggedy children playing games, and there is an intriguing, languorous feel to the place. Little has changed here on the beach at Triunfo de la Cruz for a couple of centuries, and people like it that way. Traditionally the Garifuna hold their land communally. The community assembly gathers to decide on what happens in the territory. 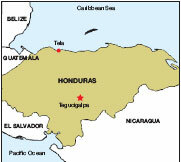 Sovereignty lies not in the Honduran state, but with the Garifuna as a whole. The Garifuna made this arrangement work without interruption for 200 years, partly due to the isolation of the coast and the marginalization of the community. Nobody else wanted to live in such a wild and remote region, so they were left alone. Sensing encroaching danger, the Garifuna achieved legal recognition in 1992 for their communally held land. After decades of struggle, they thought they could rest easy. In 1994, powerful business and governmental interests made their move. They imagined a Honduran version of Cancún that would bring the state and investors bags of money. Locals looked on aghast as suddenly a big fence went up on the beach at Triunfo in 1994, and the building of luxury villas commenced. 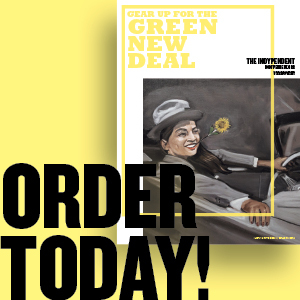 They were “going after the sun and the beach.” A privatization bill was passed that rendered the communally held land titles of the Garifuna useless. 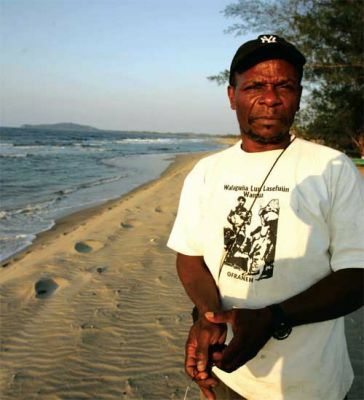 The Garifuna took local and regional authorities to court in 1997, but three activists with the Land Defense Committee of Triunfo de la Cruz were quickly assassinated. Alfredo Lopez was jailed for seven years on trumped-up drug charges. Members of the Honduras Black Fraternal Organization (OFRANEH) have also been targeted for state repression. Their houses have been searched, and the members themselves have been illegally detained, surveilled and harassed. The last deadly assault was aimed at the OFRANEH president, Gregoria Flores, who suffered gunshot wounds while walking down the street in a nearby town. OFRANEH’s base of support is predominantly among women, and it was the women who responded with direct action against the first tourist project, occupying the site and building their own alternative community-based eco-tourist cabins alongside the stalled resort construction site. By the time Alfredo Lopez was released from prison in 2003, the struggle was almost a decade old and the state and investors were garnering support for their mega-tourist resort plans from high capital — the World Bank and the Inter- American Development Bank — while relentlessly wearing away at community resistance. What followed was the multi-million-dollar Los Micos Beach and Golf Resort. The development affected not only the beach but also the wetlands behind Tela Bay upon which the Garifuna depend for their livelihood. “We don’t play golf!” laughs Alfredo Lopez, pointing out the absurdity of putting an extravagant golf course on Garifuna land. Ironically, the jobs promised to locals have not materialized, as companies opt to bring in employees from outside the community. Confronted by the heavily guarded new enclosures appearing along the beach, Lopez comments, “We are not used to living with fences or to walk among armed security personnel. They block access to the beach, and local tourism is affected. What kind of development is this that only benefits the businessmen and the owners of the projects and goes against the culture and ways of the communities?” Some sectors of the Garifuna have given in and take the government view that the development of mega-tourism is inevitable. “This is going to happen, the question is how to prepare,’’ says Natividad Rochez, the Tourism Ministry’s coordinator of ethnic projects and himself a Garifuna. Government-friendly Garifuna NGOs are popping up, ostensibly representing locals, but in reality bankrolled by big business. The state’s battle for hearts and minds is fought village by village, house by house, and generally negotiated through the wallet. But resistance continues. In Tela Bay, roads are blocked and construction of the hotels sabotaged. Mass marches are held in the capital of Tegucigalpa. Resistance is both collective and individual, like the single old lady who refuses to budge in the center of the development at Miami village, forcing developers to build their mega-complex around her little hut. Athletic and in his 50s, Alfredo Lopez has a weathered face and a mouth full of metal that sparkles when he smiles. Sitting under a large old tree outside his house while his children scamper nearby, he looks weary. 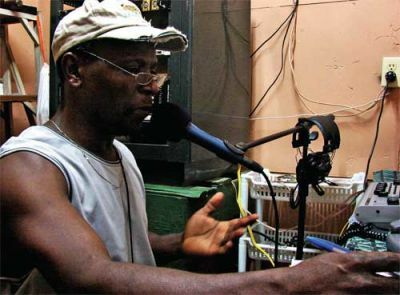 Refusing to be silenced, Lopez has emerged as a fearless voice denouncing injustice on his radio show on the local Garifuna Radio Faluma Bimetu, (the Sweet Coco) and the regional Radio Progreso. Implacable, he seems a living example of the dictum that what doesn’t kill you makes you stronger. His is a world of total defiance against the government, the foreign investors, the compliant NGOs and most of all, the local authorities in the town of Tela, those who framed him and killed his comrades. “El Turismo is using local people, setting up NGOs as fronts, paying them well, buying some, pressuring others,” he says. “Our community assemblies are infiltrated by individuals working for El Turismo, they try to foment division. His teenage daughter arrives with a couple of plates of food. Delicious chicken, I’m thinking, savoring the home cooking. “You like it?” asks the daughter. “It’s shark,” she says with a laugh. The conservation NGOs are pressuring the fishermen, Lopez explains. Garifuna have always eaten shark and sea turtle and other now endangered ocean species. “It’s not us who emptied the ocean, we have always fished just for subsistence. Industrial fishing depletes the stocks,” he says. People constantly come and go, having a quick word with Lopez or looking for information. A large dreadlocked fisherman with hands the size of oars greets me like a brother, warm and friendly. He assures me he is in the fight. “To the very end,” he says, with a great booming laugh. Another man, clad in city attire, hands Lopez an envelope and leaves quickly, glancing about him. Cloak-and-dagger stuff. “We have our sources in the municipality,” says Alfredo, his gold teeth flashing. “I broadcast all the inside information we receive on my radio show. The enemy are my best listeners because they know I’ve got the inside information!” He chuckles. Ramor Ryan is the author of Clandestines — The Pirate Journals of an Irish Exile (AK Press 2006). He lives in Chiapas, Mexico.